Composite structure diagrams describe which object relationships are valid and which ones are not. Structured Classifier = a Classifier with behavior that [can be described] depends on referenced instances. So far my notes on composition structures. In a class diagram, you can model a composition with a certain multiplicity. With a composite structure diagram, you can put additional constraints on those multiplicities. Here is the part of the merged metamodel that concerns composite structures. As always, abstract classes are not marked. 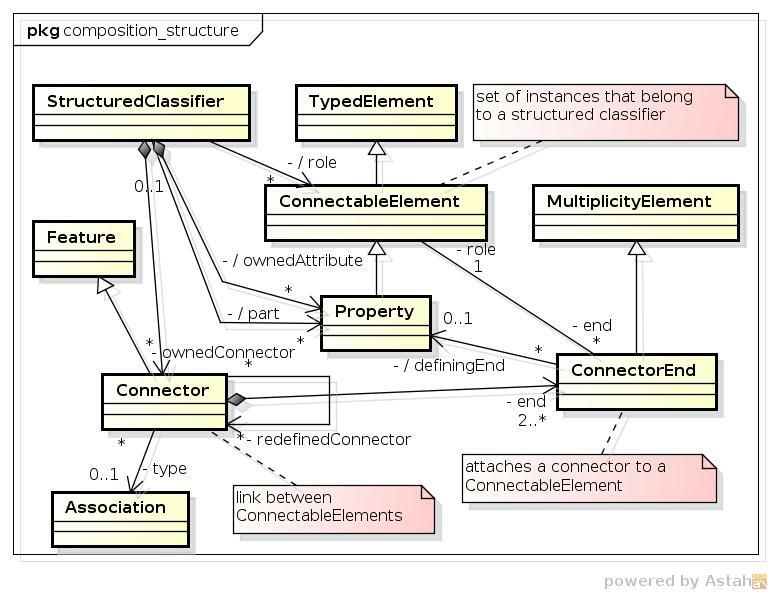 How exactly do the metamodel instances look like for a given composite structure diagram? This will be the next article in this series. Dieser Beitrag wurde unter Metamodelle, modellierung, OCUP, omg, uml abgelegt am 5. Januar 2014 von modellierung.net.